Grave/Memorial Location XIX. F. 1. Lieutenant Colonel DONALD GRANT 'Don'WORTHINGTON, rests next to his brother Major JOHN ROBERT 'Jack' WORTHINGTON in Bretteville-sur-Laize Canadian War Cemetery. Photograph from British Columbia Regiment (BCR) Archives, published in Canadian Military History Journal article Lost In Normandy; The Odyssey of Worthington Force, 9th August 1944 by Mike Bechthold in April 2015. Citation: Mike Bechthold (2010) "Lost in Normandy The Odyssey of Worthington Force, 9 August 1944," Canadian Military History: Vol. 19 : Iss. 2 , Article 2. 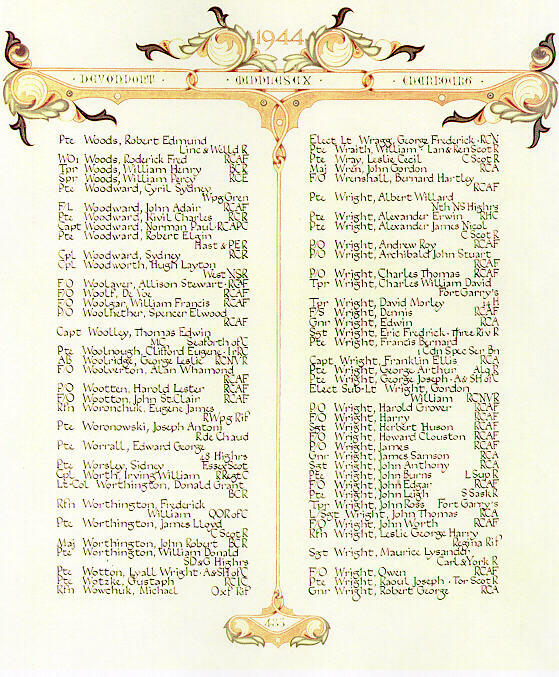 Photograph from Veterans Affairs Canada, Canadian Virtual War Memorial & Find a Grave, compiled by Shirley Tort. Photograph from Find a Grave, compiled by Shirley Tort. Photo by Mike Bechthold, published in Canadian Military History Journal article Lost In Normandy; The Odyssey of Worthington Force, 9th August 1944 by Mike Bechthold in April 2015. Citation: Mike Bechthold (2010) "Lost in Normandy The Odyssey of Worthington Force, 9 August 1944," Canadian Military History: Vol. 19 : Iss. 2 , Article 2. 6. Copy of Document available from Veterans Affairs Canada, Second World War Book of Remembrance p.483. 7. Photograph taken June 2017 by Carl Shilleto. Individual photograph: Mike Betchhold, Canadian Military History. Additional information provided by: Carl Shilleto, Mike Betchhold, Canadian Military History, Find a Grave and Ingrum @ww2_throughtheireyes #theworthingtonbrothers.